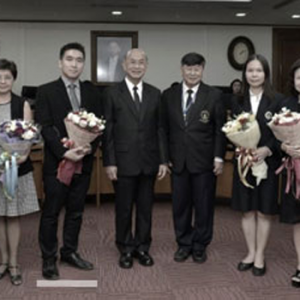 An alumnus from Mahidol University International College (MUIC) received an award from Mahidol University (MU) for having the highest number of research publications in the well-known international database Web of Science (WOS) during 2014-2015. Assoc. Prof. Chanin Nantasenamat, Ph.D., MUIC Class of 2002, and a Lecturer at the Department of Clinical Microbiology, Faculty of Medical Technology, received the award on August 16, 2017 during the 523rd meeting of the MU Council. Congratulations on your success, Ajarn Chanin!